You can make things happen today! Mars is charging into courageous Aries for the first time in nearly two years, firing you up to take decisive action in your life. So ask yourself, what major moves are you going to make with all this enthusiastic energy? A one-of-a-kind Tarology report combines the power of Tarot, Astrology, and Numerology into an incredible 14-page report based on your unique birth information. It identifies your personal weaknesses and summons your strength so you can make the best move! 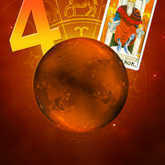 Don't let this daring Mars in Aries energy pass you by. Get a personalized Tarology report for yourself today! Or get this report at no cost at all when you take advantage of TrialPay.